I would alert the world society that Koreans never tell a truth but lots of stupid lies. | Hey, you know what? ホーム > スポンサー広告 > I would alert the world society that Koreans never tell a truth but lots of stupid lies.ホーム > Korea > I would alert the world society that Koreans never tell a truth but lots of stupid lies. I would alert the world society that Koreans never tell a truth but lots of stupid lies. Ever since after the World War Two, Takejima-Island which is clearly Japanese territory has been militarily occupied by Korean. 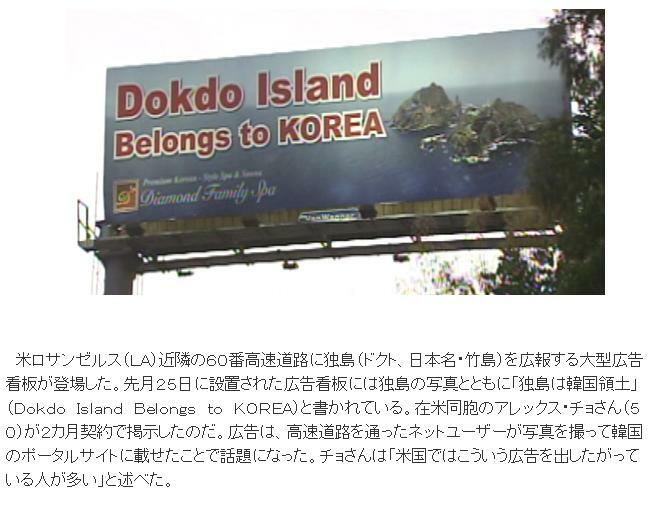 They even named the island a different name, “Dokdo” and making false information as if Takaejima-Island had belonged to Korea. What a disgusting conduct they do!They’ve put up a shameful sign. Japanese Government tried to discuss the territorial issue at the International Law Office several times, but Korean Government has been refusing to do so. They even named the island a different name, “Dokuto” and making false information as if Takaejima-Island had belonged to Korea. The reason why they never come to the International Court is that they know they would never win the case. And now they are trying change the name, the Sea of Japan to the East Sea. Also, they have started to claim another Japanese Island, Tsushinma as their territory. Japanese Nationals would like to tell the world society that Koreans are scattering a false images of Japan intentionally. Please understand Japanese are definitely different from Koreans. Regarding the explanation of issues of Takejima-Island, please refer to the site address below.